A true classic in your iPad ! 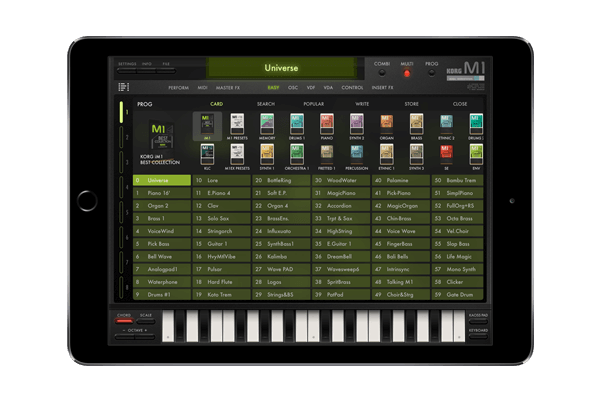 A complete reproduction – and more – of the legendary M1 that defined an era Mobile digital synthesizer for the iPad. Since it went on sale in 1988 the legendary M1 music workstation rapidly achieved record-breaking sales, becoming a mainstay of the music scene from the late 1980s and beyond. The appearance of the M1 helped musicians deliver professional-quality songs using just a single piece of equipment. The design goal of the M1 was to deliver sound that would satisfy professional needs in two areas: performance and music production. This goal became the new direction for the PCM synthesizers and desktop music sound modules that subsequently appeared, and has been carried on to the present day with KORG’s flagship model the KRONOS. High-capacity sampling and the increase in computer speed have enormously improved overall sound quality from a computer, but generating sound that delivers a real sense of presence demands technology and ideas beyond those that merely improve sound quality. The common element of electronic instruments that have left their name in history is that they had a unique sound that was difficult if not impossible to replicate. Sounds such as the “M1 Piano” and “M1 Organ” are instantly recognizable and have appeared on countless hit records over many years, and yet these are sounds that could only be produced by the M1. And that’s what you can now have on your iPad! The PCM data provides the library of the original M1. For the hardware, we analyzed the circuit diagram of the original design, and completely replicated it in software down to the last detailed parameters. Engineers with an exhaustive knowledge of the M1 made careful adjustments in order to obtain the sound of the original instrument, something that cannot be obtained simply by sampling the original sounds. We’ve also designed the iM1 so that programs and combinations are entirely independent – a capability not possible on the original unit. 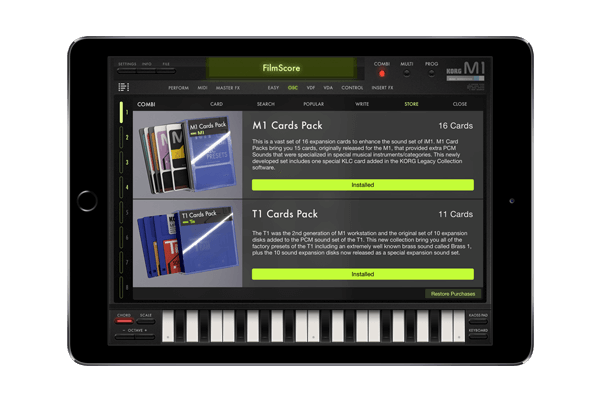 iM1 gives you a powerful, flexible and professional environment for mobile music. Not content with simply reproducing the original, iM1 provides further evolutionary developments. Synth parts now have the filter resonance that was requested at the time of the original unit, as well as VDA modulation. The effect parts, originally consisting of only two master effects, have been powered-up to 18 insert effects which include a compressor effect that’s ideal for balancing out the sound. The user interface has also been refreshed with additions such as a new “KAOSS pad” that allows intuitive performance via the iPad’s touchscreen. iM1 is the ultimate version of the KORG M1. In addition to all 19 of the PCM ROM cards originally released for the M1, iM1 also covers the sounds of the M1EX which expanded the internal PCM of the M1, as well as the sounds of the KORG T-series synthesizers which appeared as an evolution of the M1. There’s also “BEST OF M1,” a selection of 100 great M1 programs. The new “Smart Sound Browser” takes advantage of the large screen size of the iPad, making it quick and convenient to find the desired type of instrument or tonal character from this gigantic library. You can also view the sounds ranked by how often they are selected by iM1 users around the world. This is a great way to experience a huge variety of sounds that you otherwise might have missed. iM1 features a “KAOSS pad” from the popular KAOSSILATOR, allowing you to perform intuitively just by touching or swiping the screen. By using the dual KAOSS pads to play chords or adjust the sound, even people who are not accustomed to keyboard instruments or knowledgeable about synthesizers can enjoy performing M1 sounds. There’s also a conventional keyboard screen (virtual keyboard), as well as the “smart keyboard” featured on KORG’s Gadget app, which lets you specify a scale setting appropriate for your song and play chords with a single finger. In addition to enjoying iM1 on its own, you can connect a MIDI keyboard* via a Lightning adaptor (sold separately) and play the iM1 as an external sound module. The original instrument required some space and effort to carry around, but now you can easily take along an even more powerful workstation sound module as part of your iPad-based compact and lightweight mobile system. “Bluetooth MIDI,” the latest iOS 8 technology, is also supported, allowing wireless connection to a Bluetooth-enabled controller. 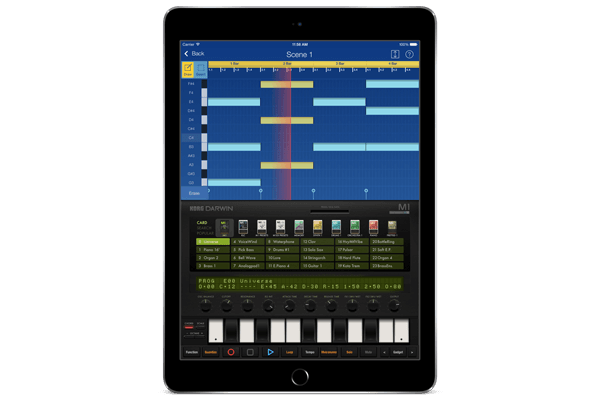 iM1 can be used together with KORG Gadget, the music production DAW app that won the App Store Best App of 2014 award in Japan. 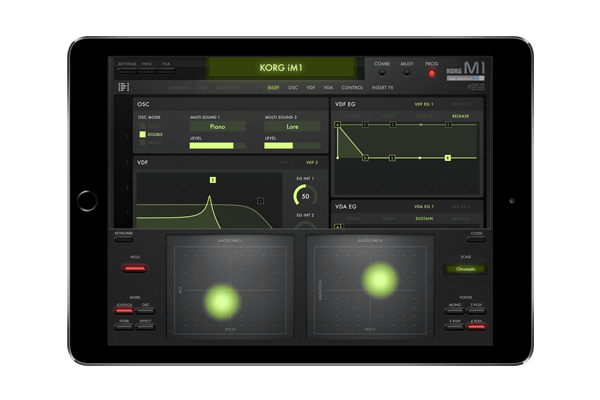 If both apps are installed, you can use iM1 as a sound module within KORG Gadget, taking advantage of the program sounds you created in iM1 for use in your own song production. Since the iM1 sound module covers a wide range of genres, combining it with the highly distinctive Gadget collection lets you cover the full range of musical possibilities. iM1 also supports Audiobus and Inter-App Audio, so it can also be used as a sound module for GarageBand. With a convenient and richly varied set of sounds, iM1 can be the foundation for either of these music production environments. What to say that’s not been already described in details by Korg ? It’s true, the M1 was a classic and the flexibility of iPad / iOS can only offer good new functions to this software edition of the Korg M1. 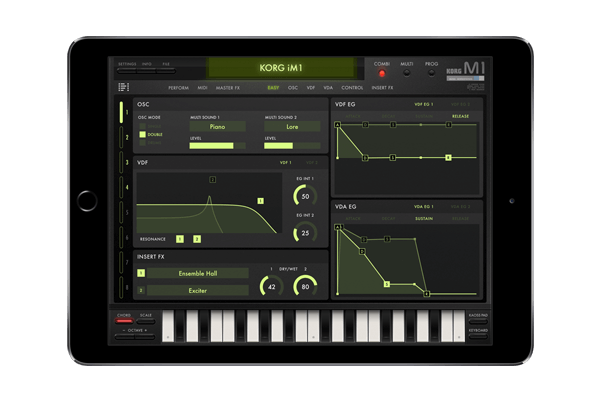 The iOS / Apps market has become huge and players like Korg can only raise the bar higher, it’s a good thing and in this case the M1 should be a big success.